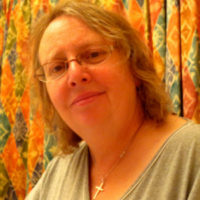 Janet Lees is a minister of the United Reformed Church. She served at St James Sheffield from 1998-2004, where she first heard about the ministry of Madge Saunders. Janet led the group that visited her in Jamaica in 2002 and wrote about her life in 2004 in the book ‘Daughters of Dissent’. To be the first woman doing anything is often dangerous enough. 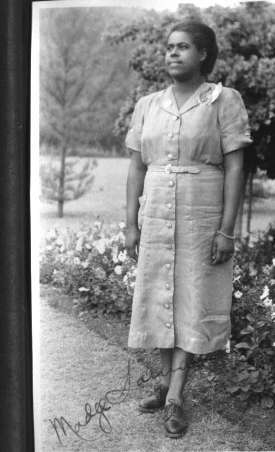 Marjorie Prentice Saunders (1913-2009), forgotten woman, Jamaican pioneer, had many firsts, and to my mind this makes her dangerous enough for inclusion in the Dangerous Women Project. ‘You will find the vast majority of people in this country are friendly and willing to assist you’ are amongst the opening lines of the booklet ‘Living in Britain’, published by the British Council of Churches to help those arriving in Britain in the 1960s and 70s to find themselves at home. The manuscript was by Marjorie Saunders, or Madge as she was known. In the language of its day the booklet tells you about employment, housing, health and children’s services. There’s the ‘man who comes and empties the meter of all the coins you have put in’, the male Landlord and Rent Officer and of course the male doctor, although I’ve no way of knowing whether all of these men were directly from Madge’s hand. Certainly her concern for children is there: ‘Vitamin D is especially important for babies and young children’ and furthermore ‘Potatoes are better for your health than polished rice. Oatmeal and rolled oats are good for you’, and also the address of the Vegetarian Society. There’s also advice about how to encourage play and learning in young children. This is no surprise: Madge was one of the founders of the Basic School movement in Jamaica. Although Madge is thanked for her manuscript the whole is credited to Douglas Tilbe, who as then Director of the Community and Race Relations Unit of the BCC. It was later reissued when Asian migrants from Uganda came to Britain. Although the booklet affirms that a warm welcome awaits in Britain, Madge’s own experiences were varied. She first came to Britain when she studied Mission at Edinburgh’s St Colm’s House, the first Jamaican woman to be trained there (arriving in 1946 for three years). Then a training house for women missionaries, her signature survives in the Birthday Book. It was a community of women from many nations and Madge mostly found this affirming, although she did encounter racism there. She returned to Jamaica and her work in education, both in Basic Schools and in High Schools and the church. It wasn’t until 1965 that she returned to Britain. There had been much to do in Jamaica, particularly in basic educational provision and in expanding work with girls’ and young women through the Girl’s Guildry. This organisation had begun in Scotland (and later amalgamated with the Girl’s Brigade) and was for the formation of young Christian women. ‘Struggling’ when Madge took on the organisation she developed it into an international Caribbean organisation and was always proud of the women who came though to leadership roles in Jamaica and other Caribbean islands. Britain in 1965 saw many changes and challenges. Church leaders in Britain began to realise they needed help from the Jamaican churches. The majority of Jamaican people coming to Britain were Christians but the attitudes in the British churches were a major part of the problem: ‘When more than ten immigrants went into a church, the host people in the community left the church. This caused a financial crisis’ (Madge in an interview about her life). In response Madge gave talks, led community discussions and study groups, spoke at conferences and on the radio and television. She wrote about ‘being on call twenty-four hours a day, sleeping with a telephone by my bed ready to help anyone in distress’ (Challenge of Service, 10th Anniversary Brochure of the UCJ). She recalled racist graffiti being painted on the door of her flat after she was interviewed by a local paper about remarks made about immigrants by Enoch Powell. She recognised that the church needed to be united in its efforts to combat racism: ‘No one denomination can go it alone as we tackle the evils of racism, injustice and the moral and spiritual breakdown of our time’ (ditto). She worked in an ecumenical project in Sheffield, serving a group of churches including St James Presbyterian Church (now United Reformed Church) where she was ordained Deaconess (26th January 1966). Her work also included initiating a playgroup at the church which welcomes families from all sections of the community, offering support for the adults and opportunities for play and learning for the children. She lead the St James community for ten years and also played a part in national ecumenical conversations. Madge’s ministry was a combination of these practical projects and a recognition of the need to work in the community to further intercultural understanding. This meant serving in both cultural organisations like the Sheffield and District West Indian Association and local schools, play groups and youth projects. Her experience in the basic school of Jamaica would have been an important foundation. There she had encouraged the inclusion of breakfast and lunch to improve children’s learning, which was no less necessary in Pitsmoor in the 1960s and 70s as it had in Jamaica earlier in her life when she had opened a school kitchen at Galina Elementary School. Reflecting on her ten years as a missionary in Sheffield, the UCJ described her as ‘a bridge’ between the white host and black immigrant communities. Madge was dangerous because she supported a minority group, the black immigrants in Sheffield, and gave them a voice. She was persistent and did not stop even when she herself was targeted by racists. She was dangerous as a pioneer both in Britain and in Jamaica tackling issues that many shied away from: nutrition for children, support for teachers, leadership for young people. She returned to Jamaica in 1976 to become the first woman ordained in the UCJ at the Salem United Church. She continued her work to develop leadership skills in young people, where the Madge Saunders Training Centre was named after her. She was dangerous because she continued undaunted all of her long life, even giving up her house to provide bursaries for young people after she retired, and moving to a small bungalow as she thought their education was more important than where she lived. In 2002 a group from St James Church Sheffield went to visit her in Jamaica. These were ‘her Sheffield people’ who remembered her pioneering ministry in the city. Madge still had the scissors made of Sheffield Steel that the Mayor had given her when she left to return to Jamaica. No doubt they had proved useful: she continued to encourage the UCJ right up until her death aged 96 in 2008. One participant in the visit from Sheffield to Jamaica recalled ‘Everywhere we went people said “Madge helped us do this”’. It was this persistent effort on her part to support and empower ordinary people that made her a dangerous woman. More about Madge Saunders can be found in ‘Daughter of Dissent’ edited by E Kaye, J Lees and K Thorpe (published in London by the United Reformed Church, 2004).